I shared 8 zines on Twitter, one each day of Hanukkah. I’ve gotten around to scanning and posting. So here they are as a PDF. Feel free to print and share these zines for personal use, but please talk to meee if you’re interested in selling copies of any or all of these zines. 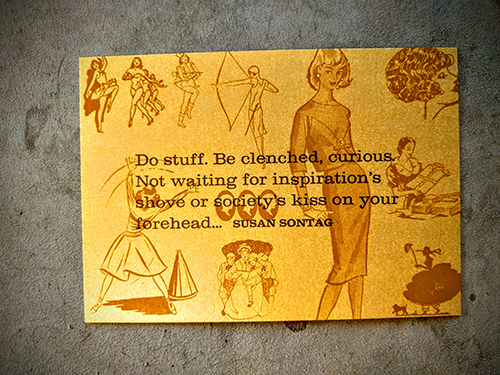 To cut and fold your one page zines, you can follow this tutorial — it has pictures! I’ll try to remember to share these again next December, before Hanukkah starts on December 22, 2019. I help with sponsorship at a lot of tech conferences here in Portland. Last week, someone even tried to give me money for a conference I’m not helping with because they assumed (correctly) that I knew how sponsorship worked for that conference. Apparently, I have a reputation. Please note that I am not an organizer for most of these conferences and I haven’t necessarily talked to the organizers of each conference. I used information available online to create this document. If you see incorrect information, please let me know and I’ll update it right away. I am asking you for your email address in exchange for this PDF. First, I’d like to be rewarded for my work, not just in creating this PDF, but also because I do a lot of free labor on tech conferences here in Portland. Knowing who is interested in sponsorship and how to reach you makes my life a lot easier, so, yeah, I’m charging you the currency I find most useful for access to my tools. Second, I’m considering sending out an update version of the Portland Prospectus towards the end of the year. I plan to send out a notification of when the new version is up. I’m also considering sending some other updates, like information about when local calls for proposal close. If you’re not in Portland, you’re still welcome to download this PDF and sponsor our local tech conferences. You’re also welcome to copy this concept for your local community — I’ll even give you some spreadsheet templates if you contact me. Then, please, send me a copy of your finished local prospectus! Reading today’s headlines would have made Saul Alinsky proud: around 200 activists grabbed the national news cycle by holding a dance party. Of course, holding the dance party outside of the vice president-elect’s home in Washington, D.C. definitely helped. I do not like the aftermath of glitter. Glitter gets everywhere and stays there for approximately the rest of forever. Seriously, glitter is so good at adhering to things that forensic scientists have written lengthy odes to glitter’s value in solving crimes. But we’re going to need a lot of glitter for protest dance parties in the near future, so let’s talk about the environmental impact of glitter. On Amazon, you can buy glitter by the pound for under $20 per pound (which I’m not linking to, because no one should have that sort of power). When you buy a pound of glitter, you’re buying a pound of tiny pieces of plastic you fully intended to scatter around. Glitter is really does stick around forever. So we need to switch to the biodegradable stuff. Luckily, biodegradable glitter comes in a variety of lovely colors, perfect for adding that something special to your next protest. No word yet on what forensic scientists think of biodegradable glitter, though. Every American Inauguration Day has been celebrated with fireworks. The president-elect is keeping the fireworks for tomorrow’s festivities, even though he fired Charlie Brotman, who has announced every American presidential inauguration since 1957, when Brotman swore in Dwight D. Eisenhower for a second term. Brotman also was the stadium announcer for the Washington Senators, as well as announcing tee ball games on the South Lawn of the White House. I’m excited to share the template I use for creating in-house style guides, as a reward for The Responsible Communication Style Guide Kickstarter reaching $10,000 in backing. Want to really improve your company’s communications? Back the Kickstarter today! TL;DR: Here’s the link to download my in-house style guide template: the style guide as a .docx! Keep reading for some context! 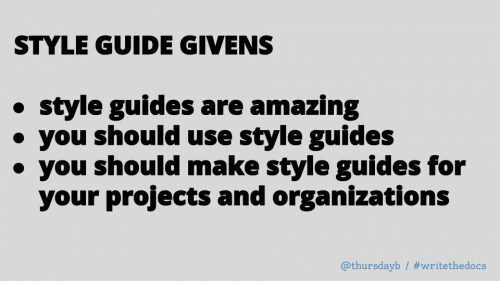 Whenever I sit down with a prospective client to work on their content, I ask about style guides: Does the organization or project rely on a particular style guide? How do they enforce style guidelines? How do they update the style guide? I get a lot of blank stares. That’s okay, because very few of the organizations I work with are founded by trained content creators. 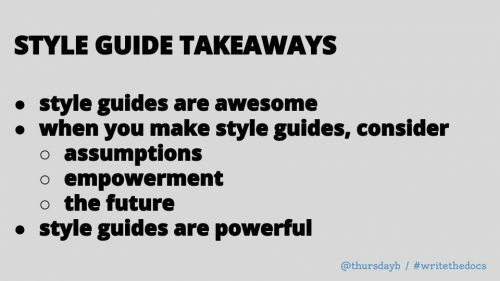 While I know that anyone who already has a style guide in place will be easier to work with, I don’t consider a lack of a style guide a problem — at least before we start working together. I do insist, however, on making a style guide before we start on any other content projects. I need a style guide before I can create new content, audit old content, or even decide on what belongs in an editorial calendar. Creating an in-house style guide isn’t that difficult of a process, provided you’ve made a couple dozen style guides over the length of your career. Part of that is experience. Part of that is building a template that can be customized to different organizations quickly. While I can’t give you a self-serve package of my expertise, I can give you the template that I’ve built up over the past decade or so. I’m sharing this document as a .docx so you can easily adapt it to your own ends. You’ll want to start by reading through the style guide and adding in the information your organization needs to reference regularly (like exactly how to spell, space, and capitalize your company name). After that, you can share it with your team. Remember, your style guide is a living document. Whenever new questions come up, add the answers to the guide. Whenever your organization hires a new person or releases a new product, add them to the guide. Whenever a content creator screws something up, add the information they need to avoid future problems to the guide. Schedule a regular review to update and clarify your in-house style guide. This template, by the way, is also a living document. 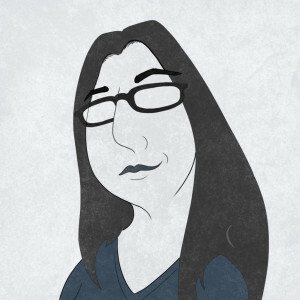 I keep adding information to it, tweaking it, and looking for ways to improve it. You’ll notice that there’s some information about writing inclusively in this guide. If this is a topic you’re just starting with, I recommend reading the white paper I released with Recompiler Media on quick changes your marketing team can make to dramatically increase your audience (PDF!) with an inclusive approach. If you aren’t thinking about inclusivity, you’re probably reaching only a fifth of your potential audience. If you are thinking about inclusivity, you can take your content to the next level by backing The Responsible Communication Style Guide Kickstarter. I’m working on The Responsible Communication Style Guide with Recompiler Media. This project is something I’ve been thinking about for years and I wanted to write up how I got to this place. Our Kickstarter is here — backing at the $15 level is the fastest way to get a copy of The Responsible Communication Style Guide to use in your own work. This post is over 2,500 words. There’s some heavy emotional stuff in here (lived experience + the Holocaust, how language affects our lives, and diversity in technology). I do hope you’ll read the whole thing. I screwed up early in my career as a freelance writer: I conducted an email interview with an individual named “Chris” for an article I was working on. In the article, I referred to Chris with a male pronoun. My source emailed me immediately after reading the article to say that “Chris” was short for “Christine” and that she would appreciate me fixing the error. Chris was super nice about the whole thing, making me think that I wasn’t the first person to make this particular mistake. Now I do some obsessive Google-ing if I’m not sure how to describe a person just from an interview — though even Google can’t always tell me enough information. Ever since, I’ve also been looking for a guide or workshop or some sort of education on how to ask questions about identity without being offensive. Sure, asking someone their pronouns is one of my standard interview questions (along with how to spell their name and what their professional title is), but that’s not enough. How do you even begin to ask a trans person about referring to them by their dead name if you’re writing about them during a time when they still used that name? How do you make sure that unconscious bias doesn’t influence your writing? How do you write about someone engaged in activism without bringing an internet shitstorm down on their heads? Heck, how do you even determine if you’re only telling stories about people like you or if you’re finding diverse sources or stories? I don’t have the one true answer to all these questions. Figuring out how to handle these sorts of topics requires both empathy and context. Context, in turn, requires lived experience. What is ‘lived experience?’ Lived experience, or the experiences, emotions, and impressions of a person living as a member of a minority, is easily dismissed as a buzzword from a women’s studies class. Hanging out in tech circles, I mostly hear people talking about their lived experiences and how they differ from what other people may see (such as a woman talking about an act of discrimination, only to be told by a man that he’s never seen any problems in the industry). While I don’t think that this sort of gaslighting should be dismissed, there are even bigger dangers to ignoring others’ lived experience: My paternal grandfather was a Holocaust survivor. He spent six years in concentration camps. When he was liberated in 1945, he was 18. He weighed 85 pounds. In the years that followed, my grandfather encountered Holocaust deniers. These people told my grandfather that the hell he went through never happened. I don’t want to turn this blog post into an example of Godwin’s Law, but every time I hear someone discounting lived experience, I see them become a little more willing to accept anti-Semitism and other bigotry. Suffice it to say that I strongly believe in the importance of involving someone with lived experience when creating training materials about their identity, history, community, and other related topics. At the same time, expecting anyone (no matter their lived experience, expertise, or knowledge) to educate either individuals or organizations purely out of the goodness of their heart is both rude and unreasonable. My landlord doesn’t let me live in my apartment out of the goodness of its warm, fuzzy, corporate heart, so I need to spend my time in a way that gets my rent paid — and I expect the same to be true of every human I encounter. (Kronda Adair has written several brilliant posts on this topic — start with this post.) In the event we all wind up living in a communist utopia, remind me to revisit this point. That means paying multiple editors to look over my work who can bring the right context to it, right? Since I don’t have a lot of money, I generally can’t afford to work with more than one editor on a project. As it happens, since I write for the web, I often can’t afford to work with even one editor. I use a ton of technology. There are tools to analyze common grammatical mistakes, such as the spell check tool built into most word processors. But there are also tools that do more specific editing tasks, such as the Hemingway app, which helps writers to follow Hemingway’s writing advice (limited adjectives and adverbs, short sentence structures and so on). I got an education in writing and communications, and then kept learning. I have a couple of degrees in communication, which included loads of classes on writing. I also still read a ridiculous amount about writing. I kept learning after getting a degree, using self-education materials available from experts, ranging from writing hacks to full-fledged textbooks. A degree isn’t necessary in this field and an in-person class isn’t even required. 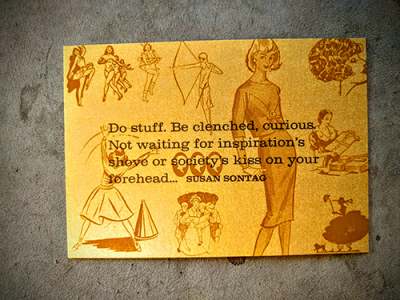 Lastly, I adore my style guide. I don’t (usually) sleep with the AP Stylebook, but I still keep both the digital and print copies handy. I also own a bunch of other style guides. I ask the publications I write for if they have their own style guides. I also have made my own style guides, both for individual publications I work on and more generally (i.e., I’ll go to bat with an editor to make sure ‘internet’ is not capitalized). That particular class was incredibly valuable, but I had to wait until I was working on a master’s degree to have an instructor start talking about how to start thinking about dealing with difficult topics, despite taking my first journalism class in middle school. How is there not a basic class in every journalism, public relations, and marketing program on how to write for diverse audiences? We teach basic interviewing techniques, like how to ask a question to high school journalism classes, but fail to teach those same students which questions to ask or who to ask questions of. I don’t know what your student paper looked like, but mine didn’t exactly reflect the demographics of our student body. It reflected the perspectives of the teachers leading the class and of the kids in accelerated English classes — despite having a big ESL program at our school, I can’t remember a single ESL student writing for the student paper. I’m not advocating for fully restructuring journalism (yet!) but we do need to make a point of teaching empathy in journalism. We’re at the beginning of conversations about representation in the media. There are a few organizations now that try to track statistics on authors and writers, like the VIDA Count. Getting more diverse writers (and other media makers) into big publications is just a first step. Telling stories of underrepresented demographics is the next step — and I’m not talking about tokenism. Pro tip: it’s perfectly fine to have an article about a technical project led by a woman without ever asking her about whether she thinks tech is a tough industry for women. As a matter of fact, skipping the focus on how different the story’s subject is means that you get to spend more time on how cool the actual project is. We still have a long way to go to get to a truly diverse media scene, though. I keep thinking of our current media landscape as the beginning of a very long journey — we’re still outfitting ourselves for the trek and don’t really know what’s on the trail ahead. We won’t even know some of the work we need to do to get to that far off Wonderland until we get on the road. 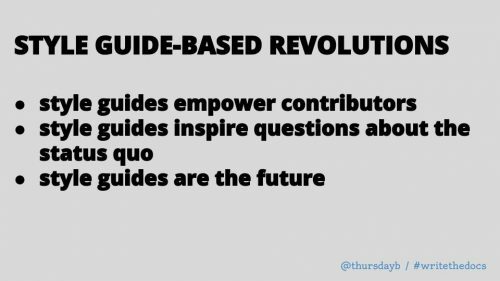 We know that we need to remodel or replace many of the systems in place to produce journalism and other media, but until that work is done, we won’t know many of the steps that come after. In my ideal world, I could just use pronouns that aren’t based on gender for writing and everything else. I recognize that I have to stick to the current system if I want readers to be able to understand everything I publish, but I certainly don’t like the existing system. Until there’s a good opportunity for a linguistic revolution, I’m focused on making the existing system better. That means starting with the writers who make the articles, blog posts, and other things we read (along with the scripts for plenty of the audio and video content we see, too). 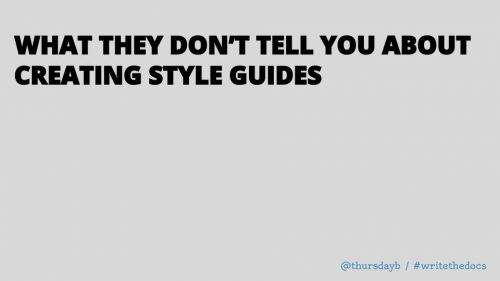 Style guides are a good starting point for talking about how we cover things because we’re already used to looking up details we might get wrong. In fact, some organizations have put out specialized style guides for how writers can cover their specific communities. These resources are all over the place, however, and sometimes contradictory. Creating a standard resource is the first step to making improvements in who writes what stories. Having discussions about diversity and inclusion before publishing anything will, at least, limit some of the more thoughtless headlines and references that we see constantly. As a personal goal, I’d like to see publishers avoid referring to an Olympic athlete as someone else’s wife. I have thought of other formats this style guide could take. I kept coming back to the idea of doing the research and running an in-person workshop, geared towards newsrooms. But while we clearly need more educational materials about writing responsibly, style guides have more power than classes. I’ve taken more writing classes than I can count. I don’t remember where all the handouts and notes are from those classes, though I can point to the occasional writing hack and say that I picked it up from a particular instructor. You could have swapped out most of my writing teachers for other writing teachers and I would never have noticed. But taking my AP Stylebook from me would turn me into a mess. And while I could manage if you took my Chicago Manual of Style or one of the other style guides I rely on, I would be pretty unhappy. These reference books have impacted my writing far more than anything or anyone else. I’ve spent the past couple of years casually talking about making a style guide that answers some of the questions I have. Audrey Eschright, the publisher of the Recompiler, heard me talking about the idea for The Responsible Communication Style Guide this spring. She said that she wanted something similar and would be willing to work on the project. We’re hiring the right people to write each of these sections and we’re paying them. None of that crap about asking people to educate us for free here. We’re creating a printed resource, as well as a website. Different people use different formats (and we’ve got some cool ideas for even more approaches once we’ve got the initial iteration ready). We’re developing training around The Responsible Communication Style Guide, because people only use resources they have some familiarity with. We agree that this sort of style guide isn’t just about writing clearly. It’s also about being able to communicate in a manner that doesn’t harm anyone: writers, editors, and publishers influence culture and attitudes so directly that we have an obligation to use that power responsibly. Yes, we’re both absolutely scratching our own itch with The Responsible Communication Style Guide. But we’re also creating something that we know there’s a need for — and something with the potential to guide major conversations in technology. 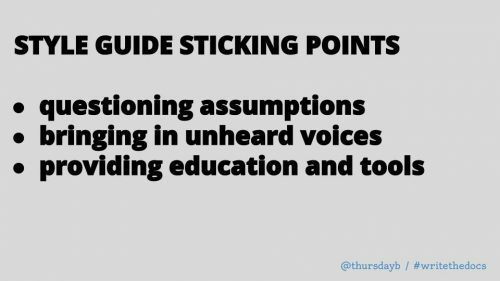 Yes, journalists working in this space need the guide. But there’s more room than that in the long run. Ultimately, everyone in technology is a writer: a programmer writes documentation, technical blog posts, and internal talks, even if they never publish a single word outside of an employer’s media. Designers, marketers, and even business analysts create reams of written material every day. This guide gives people who don’t necessarily think of themselves as writers a starting point for thinking, talking, and, yes, writing, about users in an empathetic way. There’s a real potential for The Responsible Communication Style Guide to equip us for important conversations by providing an introduction to concepts of identity and a framework for writing about those concepts. So here we are. There’s a big chunk of my heart and soul up on Kickstarter right now. I’m a bit terrified, especially of getting things wrong with the people who I want to contribute to The Responsible Communication Style Guide. I’m ridiculously hopeful about what bringing this project to life means for the books and blogs I’ll read in the future. I’m wound up waiting to see who will back this project. We’ve got just under a month to make this happen. Let’s go. If you are as excited as I am, we are looking for help! Please consider backing our project, even at a low level. If everyone just bought an ebook copy at the $15 level, we would need just over 1,300 backers — and there are far more than 1,300 people writing about these topics. Please share our Kickstarter with everyone who you think might be interested. From our perspective, that means journalists, marketers, speakers, and other folks who write publicly. But once the Responsible Communication Style Guide is a reality, we expect people to use it in ways we never considered. Please let us know if you think of any ways to make this material more accessible to your community. We have some ideas (I want a linter for writing! ), some of which will be incorporated into this first iteration of the guide and some of which we’ll work on after the Kickstarter (including my hopes for a linter). Thank you for reading this whole long post and thank you for your help. I gave this talk at Write the Docs this morning and wanted to share my slides. They’re embedded below, but you can grab a PDF here and a link to a Google Drive version with my notes here.